The cat, the flower and the mysterious broomstick combine to launch Mary into an extraordinary series of adventures involving spells, witchcraft and animals transformed… leaving her with a terrible choice to make and a frightening act to perform. I have not commented on a book of fiction that is not a manga or comic in a very long time. And yet, this is just a short book of children literature… However, after commenting on the animated adaptation by Studio Ponoc, Mary and the Witch’s Flower, I felt compelled to read the novel. I was lucky to find in the library the very first edition of the book (1971, although it was a second impression, produced the same year). That edition is now rare, but the book has been recently reprinted. I guess it will constitute my official reading for Halloween! The next day, while trying to sweep up leaves in the courtyard with a broomstick too big for her, she discovers a little broomstick, just the right size for her. As she touches the little broomstick with her hands stained with the purple juice of crushed fly-by-night, the broomstick leap. Mary clings to it, trying to hold it between her legs, but it takes flight and bring her (and Tib) up in the sky, above the world so high! After crossing a thick fog, she finds herself in a strange place and lands near the Endor College for young witches. We meets Madam Mumblechook, the headmistress, and Doctor Dee. They think she’s a new pupil and she plays along (as “trespassers will be transformed”!). She visits the school, proves that she is a competent witch, steals a spell book and promises to come back for class the next morning. As she returns home, she realizes that Tib is missing. Madam Mumblechook used a subterfuge to steal him in order to perform a transformation experiment on him. Mary goes back at night, finds Tib and use the Master Spell from the book she stole to restore Tib back into a cat (transforming back all the creatures and animals held captive by the school witches at the same time). She meets Peter, a boy from the village who is looking for his grey cat, Gib, and wandered in the magical world by accident while crossing some thick fog. They are discovered and escape on the broomstick, with Madam Mumblechook and Doctor Dee in hot pursuit. With the help of the animals that she had previously saved, they manage to escape and come back home safely. 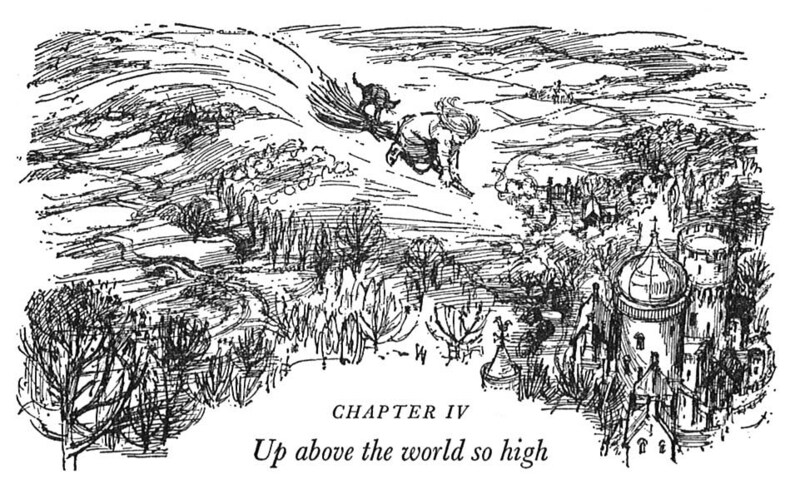 The Little Broomstick offers a nice, simple story, beautifully written — as I’ve found it is often the case with British children literature. Strangely, when such stories are adapted into anime the story is usually simplified in order to fit the new medium, but it is the opposite in this case: the anime script-writers have added to the story to make it richer and more complex. In the original story it’s not Peter that is kidnapped, but the cats; there is no other nefarious use for the fly-by-night; no household member is involved in magic. The book is more straightforward and simple. And I like it that way. 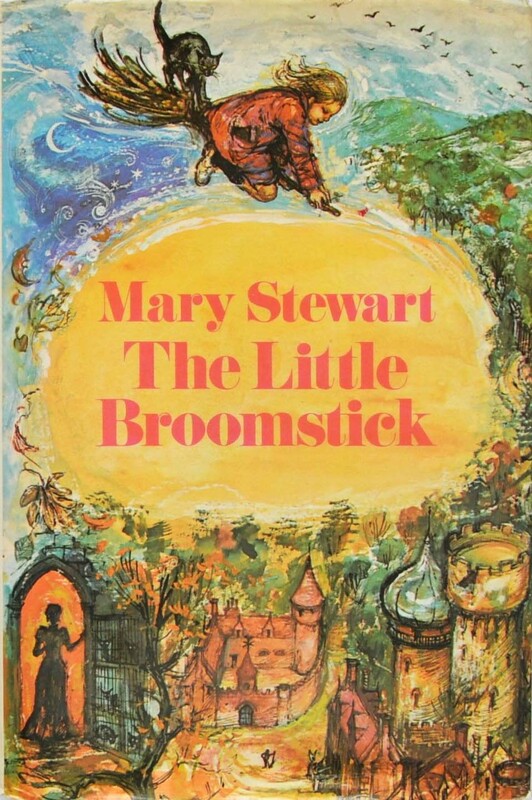 Obviously, Mary Stewart is a skilled writer, although this is her first book for children. The language she uses is charming and her storytelling is full of rich descriptions. The book is a good thriller without being scary. It encourages kids (and here particularly girls) to be adventurous, to care, stand up for others and to do what’s right. It is simple enough to be enjoyed by kids, but with enough dept to also be appreciated by adults. All in all, The Little Broomstick is a nice, pleasant read wether you are a kid or not. Text © 1971 Mary Stewart • Illustration © 1971 Brockhampton Press Ltd. All rights reserved.